Merc quests are one of the ways you can level up. Completing these quests gets you vast amounts of EXP and special rewards! 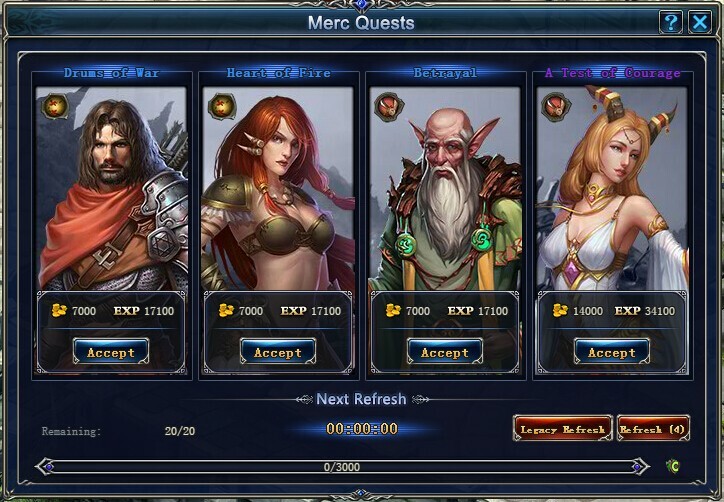 Merc quests are divided into (in ascending order): Basic, Common, Great, Epic and Legacy. The higher the level, the more EXP you'll get from completing that quest. You can spend Gems to refresh for legacy level quests with 'One-click Legacy Refresh', as well as having the option to spend Gems to instantly complete quests. You can take on 20 merc quests a day. Every 30 minutes you can refresh for a new quest, which also helps you level up mercs. When you complete a merc quest there's a chance of receiving extra rewards by answering trivia questions and through other random events.